EN 61069-8 ed. 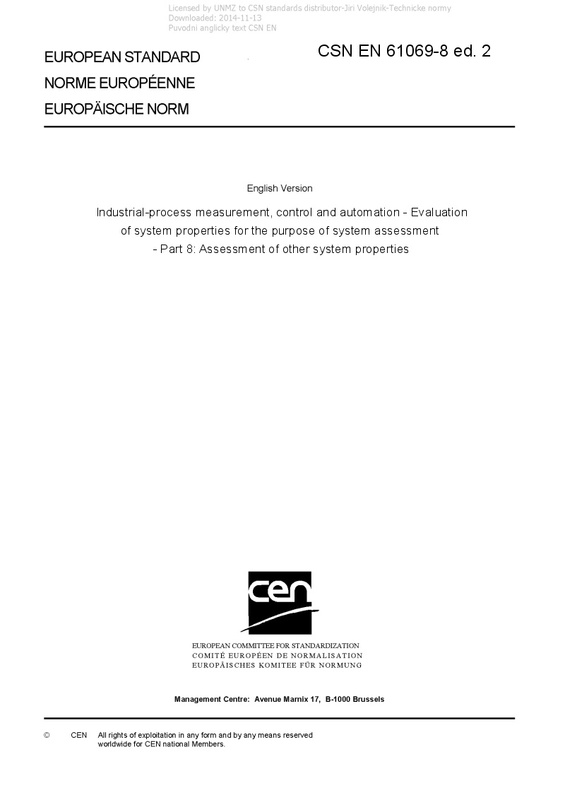 2 Industrial-process measurement, control and automation - Evaluation of system properties for the purpose of system assessment - Part 8: Assessment of other system properties - IEC 61069-8:2016 specifies the detailed method of the assessment of other system properties of a basic control system (BCS) based on the basic concepts of IEC 61069-1 and methodology of IEC 61069-2, defines basic categorization of other system properties, describes the factors that influence other system properties and which need to be taken into account when evaluating other system properties, and provides guidance in selecting techniques from a set of options (with references) for evaluating the other system properties. This second edition cancels and replaces the first edition published in 1998. This edition constitutes a technical revision. This edition includes the following significant technical changes with respect to the previous edition: - reorganization of the material of IEC 61069-8:1998 to make the overall set of standards more organized and consistent; - IEC TS 62603-1 has been incorporated into this edition.